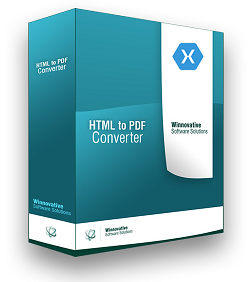 Winnovative HTML to PDF Converter Library for Xamarin can be integrated in any Xamarin application to convert URLs, HTML strings and streams to a PDF document, to a raster image or to a SVG vector image. Winnovative HTML to PDF Converter for Xamarin is distributed in a Zip archive. You can follow the link below to download the software. The Zip archive contains the library you can use in your Xamarin applications, the HTML to PDF Server for Windows and for Azure with detailed installation instructions and the demo applications for iOS, Android and Mac OS. In order to use the Winnovative HTML to PDF Converter for Xamarin you first have to install the Winnovative HTML to PDF Server. The server was built on .NET library to extend its capabilities to other platforms and languages. The client library that you link in your Xamarin applications will connect to the server to convert HTML to PDF, to Image or to SVG. The Winnovative HTML to PDF Converter for Xamarin API allows you to convert a HTML document to PDF in just a few lines a code. The programming interface is also very rich and allows you customize the generated PDF document in various ways. The code below is copied from the demo for HTML to PDF Converter that you can find the in the Demo folder of the software Zip package.